I just got back from vacation and I'm literally black and blue. No, it wasn't from mountain biking or from rock climbing or even from jostling my way through the crowded streets of Sao Paulo. The fact is my husband and I took a rather mild-mannered drive up the scenic Pacific Coast Highway between L.A. and San Simeon, and the reason I'm all bruised up is because he spotted more Slug Bugs along the route than I did. It's all my fault. 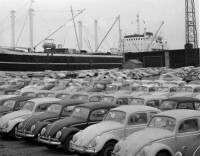 You see a few years ago the two of us were standing at a bus stop when I happened to see a Volkswagen Beetle approaching – not one of the newer models (those don't count), but an old vintage one from the 1960's – so instinctively I shouted "Slug Bug!” and frogged Marc in the arm. Really hard. At first he looked at me with the stunned expression of somebody who, well, who had just been unexpectedly frogged in the arm; but just about that time the little car buzzed by, and he knew exactly why I did it because he and his brother used to play the same game when they were growing up. In hindsight, I probably shouldn't have punched him quite so hard, as that sort of set a precedent for future sightings. (After all, girls don't normally play that rough. In fact, my sisters and I never actually hit each other in our version of the contest – we just shouted "Slug Bug” and kept score. But that's pretty lame and pathetic, compared to the satisfaction of startling your opponent with a violent smack before he even has a chance to lay eyes on the qualifying automobile.) As it was, in slugging Marc the way I did, the game was now on, which means that I can officially kiss relaxing car travel goodbye forever. Reinstating the game also brought back memories that go all the way back to 1964 – the year my family (which included Mom and Dad, my two sisters, my grandmother and my great-aunt) loaded up the station wagon and set off on our biggest summer vacation ever, driving all the way from Midland, Texas to southern California. I'd love to be able to describe all the places we visited – the splendor of the Grand Canyon, the stark beauty of the Mojave Desert, the breathtaking majesty of the Sequoia National Forest, and the elegance of Lucille Ball's home on Roxbury Drive – but the truth is, I never actually saw any of those things. I was too busy keeping my eyes peeled for that silly-looking little vehicle. My grandmother kept a running score in her "trip journal”, and as I recall it was a pretty tight game – that is, until we were on a freeway heading into Los Angeles when, to our surprise my father, who up to that point had been totally focused on his driving (or maybe he was simply blocking out the irritating noise of his six female passengers) suddenly pointed and shouted "Slug Bug Lot! I claim the whole thing!” And sure enough, coming up on our right was a huge Volkswagen lot, with about three hundred Beetles gleaming in the afternoon sunlight. Despite our shrieks of "that's not fair!” his victory was undeniable. Game over. This past week in California I took in a lot of sights – Paramount Studios, Disneyland, the famed Hollywood sign, Hearst Castle, brave-hearted souls surfing in the chilly Pacific Ocean – but the one I found most startling was the sight of young families on vacation. Almost without exception the kids in the back seat either had their eyes glued to DVD screens or to hand-held video games. It made me rather sad to wonder – what kind of memories will they have of this trip? One of my favorite movies is the original 1956 version of "Around the World in Eighty Days” and the scene that sticks with me the most is the one where they are travelling by train across the wilds of Africa. Professor Phileas Fogg (played by David Niven) is so completely engrossed in his travel logs, time tables and schedules that he never even looks up. Meanwhile, his little traveling companion, Passepartout, is practically hanging out of the train's window, lest he should miss a single glimpse of that magnificent vista. Search for See the USA! articles similar to "Slug Bug!. Search all articles similar to "Slug Bug! ".